In my last article about evaluating stocks I wrote that my starting place for purchasing stocks always starts with charts, but what is the reason that these charts look so good? The answer is a stock’s earnings and revenues or better yet how well a company grows its earnings and revenues. Today I will try to explain what I look for when it comes to a company’s earnings and revenues. Basically when I find a stock and then look at its corresponding chart and if all visually looks good, I then analyze the company’s earnings and revenues. To me, a quality stock will have rising earnings and revenues on a consistent basis (quarter over quarter or year over year). These growth rates could range from high single digits of around 8% to extreme growth rates that can be north of 50%. A simple and effective way to find out about a company’s earnings and revenues is by using MSN Money. 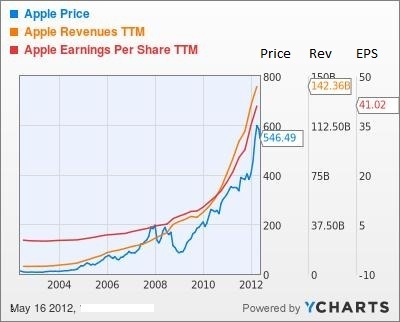 Below is an example of Apple (AAPL) earnings courtesy of MSN Money. Now, if we continue on the MSN Money site we can search for all different statistics, for example we can look at earnings estimates for AAPL by clicking on the Earnings tab while looking at the quote for Apple. This is important for investors simply because if earnings estimates are showing growth we can continue to add Apple shares to our portfolio. Indeed, Apple is expected to grow earnings at over a 20% rate for the next 5 years, in fact they are projected the grow earnings over 50%. These are precisely the type of numbers we want in our stocks. In conclusion, always remember to look for earnings and revenue growth when purchasing a stock from a company that you think is quality. I personally look for double digit growth rates year over year or quarter over quarter, once the earnings rates start to decelerate I begin to think about an exit price.